I usually work out at home, so this whole guys-working-in-the-house-all-day is putting a bit of a cramp in my style. Luckily I’ve got my beloved Zumba class running twice a week, so at least I don’t miss that. Except when I accidentally think that the class is at 6:30 when it actually started at 6 pm, so I get to the door of the school and I can peer down at all the happy, happy people doing Zumba in the gym two floors away. That happened last night. And it was sad. Luckily I was able to zip over to the Schenectady JCC for a yoga class instead. Incidentally, they just got done adding a spin room and a TRX area, so they have a bunch of new classes which I have yet to try. It’s just so much easier to go to a class when you already know that you like it, like the Pilates class with Lori. But eventually I’ll motivate. I love it! I’d always heard, vaguely, that I’m supposed to be walking 10,000 steps, and since I can’t even accurately guess the square footage of the room I’m in or whether last night’s leftovers are going to fit into the storage container with the blue top, the number 10,000 was pretty meaningless to me. And I was curious. This little gadget cost $22, which is entirely reasonable, since it’s been oh-so-informative and fun. I’ve learned that on a day that is “slacker-typical,” without a workout or a walk, I’ll have about 5-7K steps. If I’ve got a Zumba class, I’m likely to reach 13-15K steps. The good news is that most days if I realize that I haven’t been moving around enough, I can take myself for a short walk around the neighborhood and I’m golden. The better news is that I just realized that the fewest number of steps I’ve walked is on the first day that I wore the pedometer. You can’t help but want to walk more and beat your time. Like, sometimes I’ll read to J while she’s eating her snack, and lately I’ve been pacing back and forth instead of sitting at the table while I do it. The pedometer keeps track of up to 7 days’ worth of steps/calories/miles/aerobic steps, and I’ve been periodically transferring the information into a chart because I am just that much of a geek. I like to keep things organized. One other boost to the pedometer is that I’ve been playing some tennis. There’s a Niskayuna Women’s Tennis Association that people have been telling me that I should join for years, and I finally did it this year. That’s partly because Cute W has been playing more tennis and I know he’d like me to play with him more and partly because some friend were doing the I’ll-do-it-if-you’ll-do-it thing. So far I’ve got mixed feelings. Somehow I got assigned to be a “team captain” for my group of beginner-to-grade-C players. This came as a surprise to me and I managed to get reassured that I could handle it since it really just means organizing and has nothing to do with actual tennis skill. But really, I was the wrong person for the job. It makes me take everything too seriously. I fret about finding subs, I fret because between all of us we don’t always know the rules and I feel responsible, I fret because I’m supposed to make the call to cancel if it’s raining. I know that it’s ridiculous to fret about all of these things, because no one really cares and, even if they did care, it’s not officially my responsibility, anyway. But the stupid “volunteer” assignment makes me feel responsible. So I’m concocting Google documents to track the substitutes and doing various other things that are a waste of time. This morning was our second set of games and I was crabby as hell about it. I had a headache, it was cold and rainy, and someone called to say that they weren’t going to be there and couldn’t find a sub. And I was full of regret that I’d ever agreed to join. But then a kind person stepped in to play as a sub at the last minute, the sun came out, our team managed to tie instead of losing, and I had lunch with friends afterwards. So maybe it will grow on me. The only thing is that doubles’ tennis just isn’t a tremendous workout, at least when we’re not good enough to sustain volleys consistently. 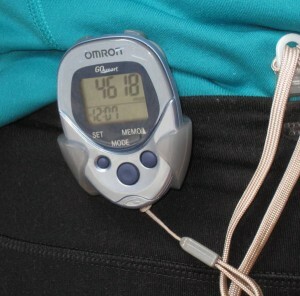 My pedometer says I’ve had 0 aerobic steps today!